Since its beginnings at the University of Jaen in 1993, several professors of the Department of Mathematics have worked to consolidate a solid research group in approximation theory. In 2000, an important year for the mathematical world, they decided to organize an international meeting on approximation in order to guarantee permanent research contacts with other specialists of this area of knowledge. As far as the location of the meeting is concerned, the organizers looked for places with a sort of special charm, and after going here and there they choose as official site the hotel María de Molina in the town of Ubeda (Jaen, Spain), declared World Heritage Site by the UNESCO in 2003. The success achieved soon made it possible to continue organizing the conference year after year and to invite prominent mathematicians from the whole world, thus making Jaen become, little by little, edition after edition, a meeting-point on approximation theory. 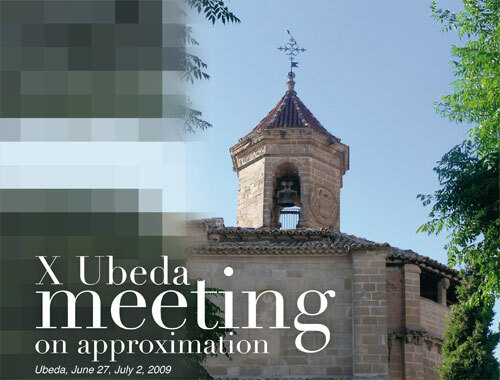 Each member of the Editorial Board of the Jaen Journal on Approximation has visited Jaen and attended at least one Ubeda Meeting, and since 2008 belongs to its Scientific Committee. For the sake of quality, it was decided since the very beginning that the participation in the seminars would be by invitation only, restricting, in this way, the number of participants and making them as fruitful as possible. Any researcher who wishes to participate may contact the organization and his/her request will be attended as soon as possible by sending an invitation. No limitations on the subject and style of the talks were imposed; contributions of all types were welcome and no parallel sessions were scheduled. Aside from the scientific details, an important part of the time is devoted to getting to know Jaen, so the social events of the conference include visits, walks, gastronomy, etc. The last edition was hold in the period spanning June 27-July 2, 2009. It counted on a long list of invited speakers to celebrate on one hand, the tenth anniversary and, on the other the launching of the Jaen Journal on Approximation. and specially to Hotel María de Molina, its staff and Juan Navarro, our Chef. See also the space devoted to the meeting in the Miscellany section of the first issue of the Jaen Journal of Approximation (Ubeda Meeting on Approximation). The forthcoming edition of the meeting will be the 10th one and will bring together a wide group of outstanding researchers.